"WE hired guides for two separate days with WERIDE. I am an experienced cross country/trail rider, and my 17 year old son is a novice. Out first guide José was terrific. He was a super nice guy and very knowledgeable about the area. He tailor made our ride to the hardtail bikes that WE had that day and WE hit mostly beginner/intermediate terrain. He took time to point out local landmarks and turned the ride into a part history lesson which WE liked. ( I'm sure he would not have continued if WE didn't seem interested). He was an excellent rider and gave my son pointers as needed. All around it was an excellent experience. WE had so much fun on the first ride WE decided to hire WERIDE again for a second half day session a couple of days later. This time WE kicked it up a notch and rented full suspension enduro bikes through WERIDE. This was a great decision, the bikes were high quality and in mint condition. Our guide for this ride was Joao. He was also a highly skilled rider and guide and designed our day to suit the terrain WE were looking to ride. WE started off with a long downhill to the ocean. The ride started by van service dropping us at the top of the scenic hill (small mountain), so no uphill riding was needed to begin. Joao read my cues as I was the fastest rider in our 4 person crew. He rode in front always looking to see how much I was pushing him and kept in front just enough to keep me flying by the edge of my seat. It was an insane ride and one of the best and most scenic downhill runs in my life. Later WE did some true downhill switchback riding through the woods. Again I was pushing Joao pretty hard and I paid the price with a big head over the handlebars wipeout and plenty of blood to show for it. But he was on the case with his first aid kit and WE were back on the trail in a few minutes. My son and the other man on the trip had a great time as well and were able to ride at their own pace. I can confirm that even the most expert rider can be challenged by the terrain WERIDE has access to. They will customize your ride! Such a great group of guys and easy to work worth - scenery is amazing too! I couldn't recommend them more! Unless you brought your own top-notch bikes, I recommend renting theirs." Great bike, great trails, great guide, can you ask for more? "If you like adventures and having fun, this is the company to book! 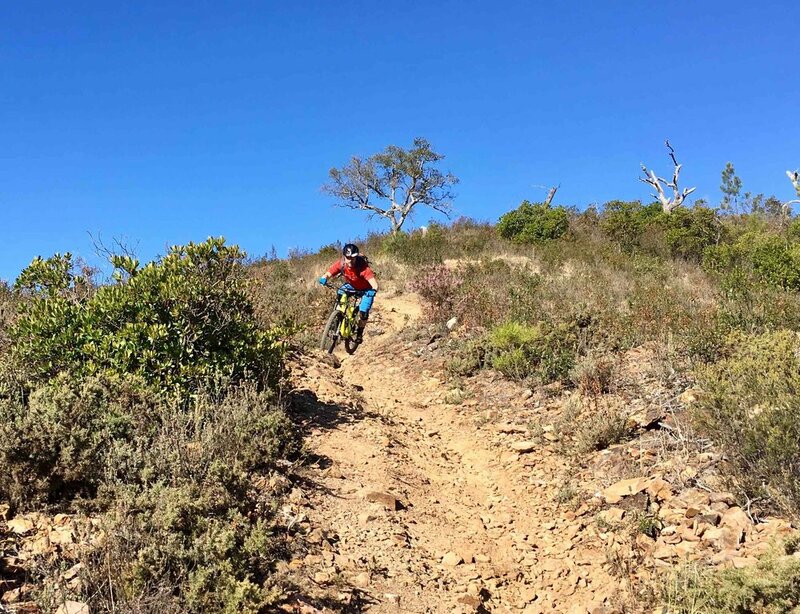 Luis (the guide) is really passionate about biking, shows you the best trails you can imagine and even tells little anedotes about Algarve area. The rental bike was an up-to-date Transition Patrol (160mm full suspension) and really a lot of fun on the trails! Great bike, great trails, great guide, can you ask for more? Definitely one of the best bike days I’ve ever had!" PACKS FOR TWO. There is something for everyone! "WE rode with the guys at WERIDE in late Sept/early Oct '17. João picked us up at the airport and guided us the first day, and Miguel showed us around for the next two. These guys build and maintain the local trails around Sintra so their knowledge is amazing. They're excellent riders and great fun to hang out with and have a laugh over lunch or on the trails. The trails themselves are sweet offering everything from burly to flowy depending on your mood and ability. There is something for everyone. One of the best things for me as a former mechanic is that the bikes were in perfect condition and dialled for each individual rider. Great value, fun and I'll be back for sure!" "WE had an absolutely great day of riding! I couldn't really offer any other recommendations, except maybe you could print some maps for clients only to use in case they wanted to go back to some of the trails on their own, or maybe include a "clients only" section of your website where you could upload some GPX files. The guides were great, they seemed to love riding and were happy to share their local trails with us. They were patient and took the time to pick routes that both challenged us and matched our abilities while building our confidence on the bike, while covering a unique variety of beautiful terrain. The bikes were amazing, the best bike I've ever rented, the quality far surpasses any other rental shop in Portugal. They were clearly maintained immaculately and tuned exactly to how I had specified. SPD pedals, brakes, and even the height of the seat was ready to go exactly to what I had filled out on the client form. You guys set the gold standard for MTB guiding in Europe! I will definitely be back and bringing friends!" Riding from the top of the Mountain to the beach! "Luis, I had a great time and was really pumped to ride trails with you. I especially liked that you are building new trails and maintaining existing trails. 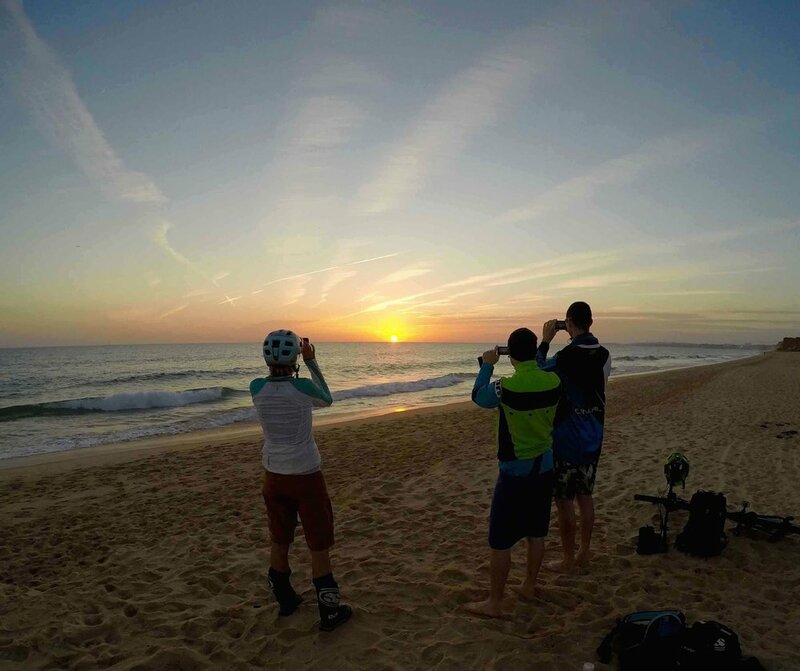 Looking forward to coming back and seeing new trails and experiencing the culture and environment of the Algarve."